MSA’s Elements Magazine – accessible articles that can be used in class. Don’t forget to check out the April 2007 issue on teaching MPG. Raman Spectroscopy Database (Free) – useful tool for those with benchtop Raman systems. Monster Milktruck! – a fun and easy way to tour GoogleMaps. Virtual Fieldtrip to Vesuvius Volcano – for those whose department budgets don’t allow the real thing. EarthChem – a powerful database, complete with plotting tools. Hugin – a free panorama photo stitcher with useful applications for Gigapan and Digital Planets on Google Earth. Please comment here or add to the Cutting Edge collection if you have useful MPG teaching resources! 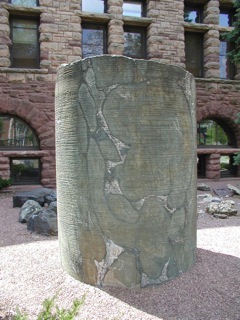 According to the Cutting Edge: "Core of Ely Greenstone outside Pillsbury Hall, home of the Geology & Geophysics Department at the University of Minnesota. Metamorphosed Archean basalt pillows are visible in the core, which is approximately 2 meters tall. Photo by Sharon Kressler." Aka: What I want for my next birthday! What a great list of resources, Meagen. So many cool websites and ideas! Inspiration for the upcoming year of teaching.